Morning offers of traders generally held steady today. Many traders were playing waiting games influenced by unfavorable futures and derivatives markets. Most small traders replenished their stocks obviously under better market expectation last week, leading to high cost presently. They see weak desire to deliver cargos. Market Transactions: Many traders are waiting for further market changes given futures market trend. Spot market transactions stand slack in Tangshan on account of blocked transportation in Tangshan. Transactions are brisk at Shandong and transaction prices basically stand stable. Transaction volume edges down. Transaction prices of PB fines stay at RMB457/tonne and RMB435/tonne respectively at Tangshan and Shandong. Market Supply and Demand: Based on transaction data, steel mills are replenishing stocks in recent days. Thus, iron ore stocks maintain a relatively high level. Steel mills are active to make purchases. Major ports in north China have faced the problem of mainstream middle and high grade fines shortage since last week. Traders see obvious desire to lift the prices. 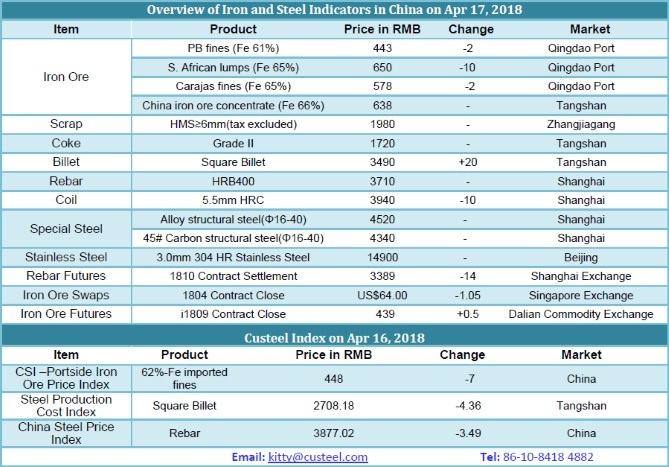 Traders were desire to replenish their stocks at a high price last week influenced by steel mills’ profits and market expectation. Thus, market participants witness strong desire to raise the prices this week.